The Vallée de Mai Nature Reserve harbours a palm forest that is dominated by the endemic coco-de-mer palms. 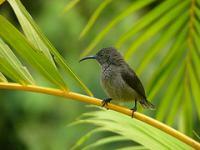 Five other species of native palms can also be found. 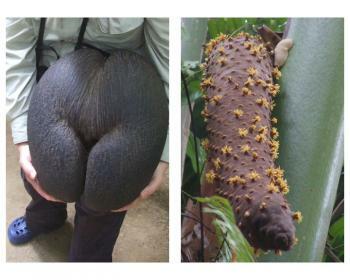 The Coco de Mer has the largest seeds of any plant in the world; the leaves growing up to 6 m wide and 14 m long. Also unique to the park is its wildlife, including birds such as the rare Seychelles Black Parrot, mammals, crustaceans, snails, and reptiles. The park lies on Praslin, the 2nd largest island of the Seychelles. This WHS is home to the largest seed in the world. I'd suggest to visit early in the morning on weekdays to avoid most tourist groups and be able to spot several indigenous birds such as the Seychelles Blue Pigeon, Madagascar Turtle-Dove, Seychelles Bulbul, Seychelles Sunbird and above all the rare Seychelles Black Parrot. I was extremely lucky to see about 4-5 pairs on one Coco de Mer tree from the 100 breeding pairs !!! The lush vegetation and tall trees are truly unique and the different trails give you a great view of the place. Do not miss the high viewpoint from one of the trails with a birds eye view of all the reserve. Moreover, the reserve houses both UNESCO certificates for Seychelles' 2 WHS including the Aldabra Atoll. In all honesty I hadn’t expected a great deal from Vallée de Mai – probably just a short walk through a virtual “botanical garden” in a rather touristy atmosphere! In fact we managed to escape the tourists (despite ourselves being in a group) and the atmosphere was magically primeval – cool and deep green with the sights and sound of running water and bird calls echoing through the shadows! The tourist hype of “Garden of Eden” might be a bit OTT but the site is well “worth a detour” if you find yourself in the Seychelles and can make it across to the island of Praslin! A problem I had feared was that the site is (one of? Any corrective information would be gratefully received) the smallest of natural WHS at a mere 18 ha (The next largest might be Messel Fossil Pit and Giants Causeway at 70 ha – but neither of these is trying to preserve a living ecosystem). Indeed it seems unlikely that IUCN would accept this site today (it was inscribed in 1983) without the establishment of proper “buffer zones” etc. As on so many matters, the “goalposts” on WHS inscription have moved significantly since the early days. IUCN does suggest in its evaluation that the Seychelles government should expand the property boundaries to include the rest of Praslin National Park - within which the Vallée sits. This of course hasn’t been done and recent evaluations (up to 2007) suggest that a far tougher line would be taken today. Another amazing aspect for such a small site is that it was inscribed on all 4 (FOUR!) natural criteria – putting it in a very select list of 20 sites alongside the Great Barrier Reef, the Galapagos and the Grand Canyon. (If anyone is interested I think that the “Tasmanian Wilderness” and “Mt Taishan” jointly hold the “record” for the greatest number of inscribed criteria – 7 out of the 10! The former is primarily “natural” and the latter primarily “cultural”). Yet the site seems remarkably reclusive about its inscription – the information leaflet, given out at the entrance (but only if you ask for it! ), refers to it and carries the logo but none of the signs or notice boards do! The site’s prime claim to fame is as being almost the only location remaining where the Coco de Mer palm tree grows naturally. This plant is the source of the nut whose provenance was unknown for centuries and had only been washed up on far away shores (it isn’t fertile after being immersed in sea water so no tree ever grew). This and its shape, remarkably similar to a human female pelvis (photo1), had long given it a mythological status. It was amusing to note at the Mahé airport tourist shops selling licensed seeds how this shape had been emphasised by “inserting” coconut fibre at the “appropriate” location as mock pubic hair – the reality just isn’t enough for some people! Indeed the reality can be even stranger than fiction – high in the tree by the park entrance we could clearly see the endemic “white slug” thought to be involved in carrying pollen from the phallic male flowers (photo 2) to the female (which reside on different plants) and, near to it, a Palm Gecko which may carry out a similar role (No, the creatures were not “stuffed”, as both had gone when we returned!). We spent a pleasant couple of hours on the trails and managed first to hear and then to see the endemic Black Parrot (Trivia question – which other island WHS worldwide contain endemic Parrot species?). The Coco de Mer is a fine example, among other things, of “Island Gigantism” and we were dwarfed as we walked. There are numerous other examples of endemic plants in the forest. Indeed the islands of the northern Seychelles are the only granitic islands in the world and are the oldest islands of any ocean. They constituted part of the Gondwanaland continent and life-forms have survived/evolved there differently from other the elements of that proto-continent as it broke into the continents we know today. (The creation of the granitic Seychelles as a “spin off” from western “India” is shown in this nice animation). It may be the smallest of natural WHS but it is a place to explore "big ideas" - and in very pleasant surroundings! Wonderful place to be, sort of like an enchanted forest! We visited Seychelles for our honeymoon in November 2006, and soon discovered much about the different islands. We did not do much research before going there, so knew nothing about the coco de mer. 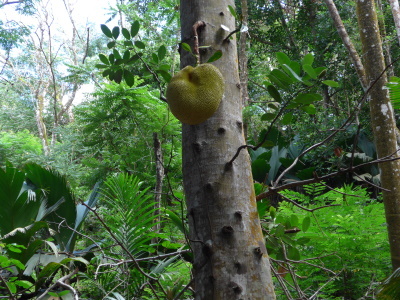 We were introduced to this by the locals when we got there, and soon learned about the forest where the fruit grows naturally, at the Vallee de Mai nature reserve. going through the forest was very exciting, we loved every bit of it. Highly recommended to visit if you are ever in Praslin.